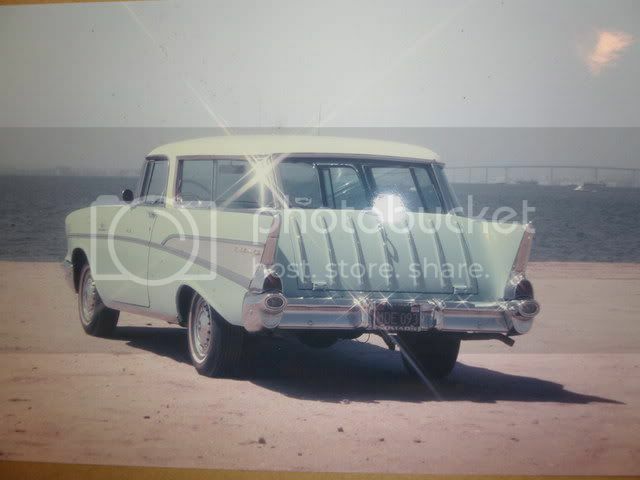 Location: Main Index » Forum Index » 55-57 Central » FREE 55-57 Classified Ads FREE » 57 Fuel injected Nomad, test car made in 56 at the LA plant. This is the pilot first Fuel Injected Nomad. Built in the LA plant along with the two pilot FI corvettes. It has been verified as the original FI car by a certified judge and has a one-off air intake in the core support that was done at the factory, we are acquiring the engineering diagrams from Chevy Archives. This is one of 106 known factory fuel injected Nomads, one of 18 known 283/283 solid lifter cars. It is well documented and featured in an early 70's book "Chevrolet: USA 1, and illustrated history of Chevrolet passenger cars". All the date codes are within 3 months of the build date and so is considered numbers matching. It is an original California Black Plate car. I have the original plates, even the original license plate shroud from City Chevrolet in San Diego where it was purchased. It has the mechanical lifter 283 with a 4800 Rochester FI (this is not the correct FI for the early cars, according to the original family, the early unit had so many problems it was changed out in early 58 to a later model unit by the dealership), power steering, power wipers, Wonderbar stereo. The car is undergoing the restoration, but if someone wants to take it off my hands now, I will part with it. Everything in the drive train has been restored; engine, trans, rear-end, suspension, brakes, fuel system. The Fuel Injection unit was rebuilt by Jack Podell. The body came back from media and we replaced the rusted panels (of which there were very few, the spare tire well and a few cargo floor pieces). All body work is done and the body is on the frame after being painted back to the original Larkspur Blue with India Ivory top. The car is ready to be finished. I have just lost steam on it. If you know how to restore a 57, this one is ready to reassemble. The car comes with a complete original interior package, all new wiring harnesses, all new rubber parts, interior and exterior screw kits, tons of other new restoration parts. The car was a complete survivor car when I started the restoration, so every part is there. you will need to do some polishing and the bumpers will need to be rechromed. The glass will need to be replaced, as the green tint has bubbled around the edges. It is ready to be put back on the road.